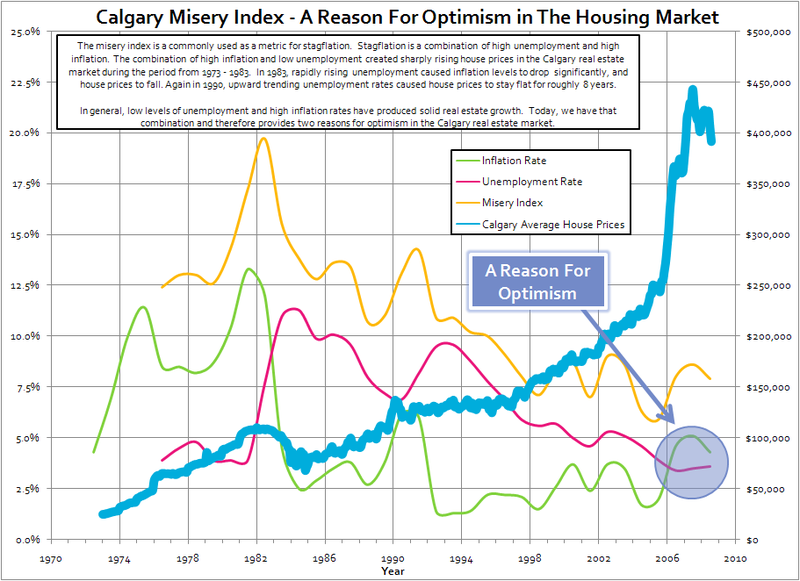 Posted by DustinRJay in Calgary real estate, inflation. The misery index is a commonly used as a metric for stagflation. Stagflation is a combination of high unemployment and high inflation. High inflation and low unemployment rates created sharply rising house prices in the Calgary real estate market during the period from 1973 – 1983. In 1983, rapidly rising unemployment caused inflation levels to cool significantly, and house prices to fall. Again in 1990, upward trending unemployment rates caused house prices to stay flat for roughly 8 years. Today, we have near record low levels of unemployment (3.6%) and relatively high inflation (4.3%) and therefore provides two reasons for conservative optimism in the Calgary real estate market.